Vising the student company trade fair leaves one jaw-open every time. School age entrepreneurs offer useful and, in some cases, freshly produced product ideas for making your life easier. One of these simple yet innovative ideas was introduced by a company called "NumCut" from Kaunas. They offer an add-on device for a computer keyboard, which can shorten various functions when working with "Microsoft Office" pack or performing arithmetic and other actions, such as sharing the document you created in a press of a button. Students from Kaunas created an app that helps parents to discipline their children. House chores or homework tasks can be designated using this app and be rewarded with points for doing them in time. Later children can change collected points into agreed entertainment or toy. However, procrastination leads to losing points. It might even go down to a minus! You wonder how such an idea could be born in a head of a pupil? One of the team members comes from a family of seven. The team "Goatrip" introduced a travel app but do not let the name trick you – the app has nothing to do with goats. Except for it can lead you to non-touristic places, where some goats can be roaming around. The name stands for a "Greatest of all trip", where users can also be creators and contributors to the app. They can check an amazing café, restaurant or place worth visiting by photographers in app. It also identifies all the spots reachable in a wheelchair. Guests from Austria also offered an original product – accessories from deer horns. Shoehorns, bottle openers, key chains and bracelets – these products are fancy lifestyle objects but they also demonstrate closeness to nature. They call people to stop buying horns from hunters, and instead to search for dropped antlers of wild deer. Team from a small town in Lithuania, Alytus, created a device based on virtual reality. However, their aim is to help people working in offices relax for few minutes, and not to spend hours playing. Company noted that they are only ones in Baltic states addressing the issue of office stress and providing the relaxation tool. Guests from a school in Italy presented an web app dedicated to use unneeded books. The app creates a network of booksharing, which connects schools, bookshops and readers, allowing them to sell new or used books. Student team "FireSec" from Norway said that safety comes first and shared the idea of an app connected to an external sensor on the fire extinguisher. The app notifies people of pressure drop in the extinguisher. Participants of the student fair had a chance to talk to a global entrepreneur and change-maker Bruce Gurfein. After starting his first business at the age of 17, Bruce later dived into banking technologies and now he is travelling the world investing in small start-ups in emerging markets. Asked about the competences a young entrepreneur should have, Mr. Gurfein says it is set of various different characteristics. "An innovator or entrepreneur will be someone who likes having fun in life and takes risks. He may not think through an idea from the beginning to the end, but will take initiative – says B.Gurfein. – Business and the way business people live has changed and will keep changing all the time." Although he travels the world and meets many young people, B.Gurfein admits he is still surprised by school-age entrepreneurs. "Although it is becoming more and more common, it's always amazing to see. I think it is the strike of independence; the lack of willingness to be dependent on others that drives them", – said B.Gurfein. 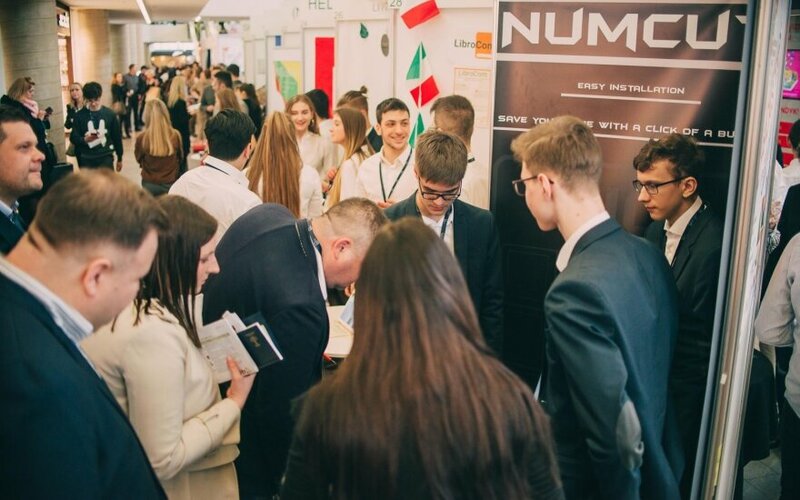 The strongest emotion he noticed among students at Kaunas international student company fair was their passion for business. 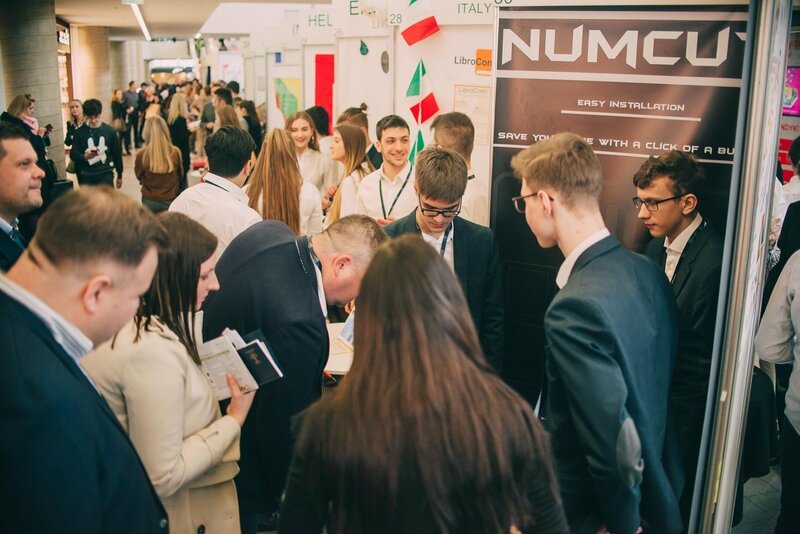 "Even those that never intend to be multinational, worldwide businesses, even those from "neighbourhood business", have that passion and love in their eyes", – B.Gurfein described participants of the student fair. Different innovations are becoming more common in student companies because, according to B.Gurfein, there is no such thing as "staying in one place", when we talk about business. Either you are getting better, or either you are failing. "So, if you are innovating, you're on your way up", – smiled B.Gurfein. Gurfein emphasised that it is essential to learn how to make mistakes and understand that your life will not always be successful and "glamorous beauty". One has to learn to convert the failures into future's successes by learning from them. While students are taught to evaluate risks, Gurfein does not see this ability as crucial for a successful business. "Young entrepreneurs usually lack the ability to evaluate risk, but at the same time this may or may not be a lack. If used in the right way this can help to overcome fear and convert crazy ideas to reality", – says the change-maker and entrepreneur. International survey of "Junior Achievement", a non-profit organisation that provides entrepreneurship education for school students, shows, that schoolchildren, who have participated in its program, start their own business 3 to 5 times more often than those, who did not. Moreover, students who took part in the JA Company Programme increase their entrepreneurial ambitions, transversal competences, school motivation and school performance. Andželika Rusteikienė, director of "Junior Achievement Lithuania" says the competences of an entrepreneur are essential to everyone who enters labour market – not only for those, who are sure they would like to run their own business. "Students who participate in business education of JA Lithuania or participate in student company trade fairs acquire essential common and entrepreneurial skills: ability to work in a team, creativity, complex problem solving, critical thinking and risk management. Those abilities are also essential in today's 21st century labour market", – says A. Rusteikienė. Vladas Lašas, entrepreneur, who invited "Tesla" to invest in Lithuania and developed a successful fast parcel company "UPS Lietuva", says that fast change of a business world and new technologies provide more and more possibilities for a young person. "Whatever profession or activity he or she would choose in life, entrepreneurship or just a simple activity, ability to reach your goal is crucial for ones future. I notice many young and motivated people, who desire to choose their path in business. I'm sure Lithuanian students equate with their most active peers abroad: I'm delighted by students' independence, curiosity, ambitions, courage to act", – says famous Lithuanian entrepreneur. In a rapidly changing business environment, the universal question becomes, is of business theory enough to find success, or do you have to feel it, fail it, and learn it the hard way. "Today young people already need to know, why they have to learn one topic or another. Independent activity, practice clearly shows, what they still need to learn, what skills do they lack. Then their motivation strikes in – they want to learn, want to know more than others and do that in as short time as possible. I would say in every situation in life you need skills, which you learn while running a student company. That is activity, teamwork, planning, responsibility, leadership. Even small problems you face, teaches you to evaluate risks of a "real world" and avoid much more serious mistakes in the future", – considers V.Lašas. V. Lašas notes, that young people lack ability to share the tasks and responsibilities sometimes, which might be an outcome of lack of business education in Lithuania. "They think that in business organisation everything goes automatically. It takes time for them to understand, how important every member of the team, every action is. I think that participating in "Junior Achievement" student companies' program provides them this missing link", – says V. Lašas.